You are here: Home | News | Cellulose Ethers | What is cellulose ether? Cellulose ether is the powdered cellulose ether generated with wood fiber or refined short cotton fiber as the main raw materials, after chemical treatment and by the reaction of etherifying agents such as chlorinated ethylene, chlorinated propylene and oxidized ethylene. 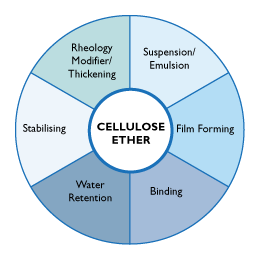 The production process of cellulose ether is complex. It starts with the extraction of cellulose from cotton or wood, which then transforms into alkaline cellulose after adding sodium hydroxide and by chemical reaction (alkaline solution). Under the action of etherifying agents (etherification reaction), cellulose ethers are generated from alkaline cellulose through such processes as washing with water, drying and grinding.